Although opinions can vary, the worst--but best known--share market downturn is called a "bear market" which tends to be defined as a peak-to-trough decline in prices of 20 per cent or more. By contrast, declines of more than 10 percent, but less than 20 per cent, are typically called “corrections“. Smaller market declines of less than 10 per cent go by many names, but I like to call them "pullbacks". At the time of writing, the S&P 500 has already experienced a maximum decline of 10.1 per cent from its closing recent peak of 2,872.8 on January 26--placing this decline in the “correction” territory so far. What do typical market declines look like? As seen in the table below, market pullbacks are the most common form of market decline--analysing the US S&P 500 Index, there have been 466 pullbacks since the market recovery from the Great Depression, with an average decline of 1.5 per cent taking place on average over one and a half weeks. Recovery on average takes a further week. Note the vast bulk of these pull backs (93 per cent) involve declines of less than 5 per cent. In short, market declines of 5 per cent or less are very common and hard to get too worried about. By contrast, there have been nine bear markets, with an average market decline in these periods of 35.8 per cent, over an average of 65 weeks. On average it takes almost twice as long--116 weeks--for the market to recover its previous peak. As the saying goes: the market goes down the elevator but up the stairs. What about corrections? The table indicates there have been 11 “corrections” which, perhaps surprisingly, is only slightly more than actual bear markets. 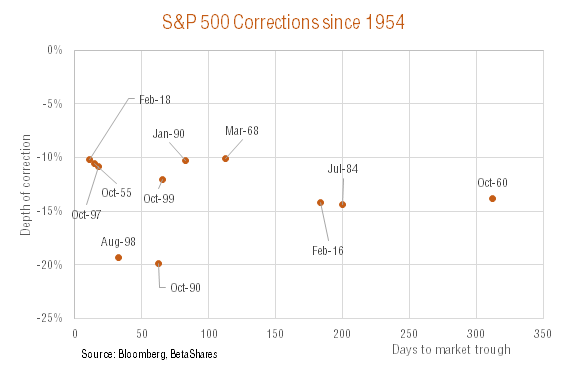 Even if we include 10 to 20 per cent market declines during a market recovery, the number of corrections grows to 13--which still implies an average of only 1.4 corrections for every bear market. 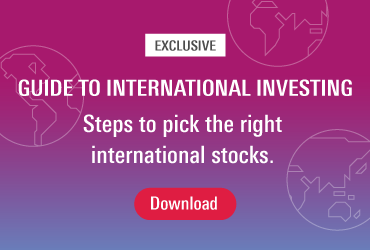 Of the 11 strictly defined corrections, the average market loss has been 13.2 per cent, which takes place on average over 20 weeks – or almost six months! Unlike during bear markets, the average time of market recovery following a correction is considerably quicker than the downturn--only 11 weeks. Breaking this down further, it’s apparent that 9 of these 11 corrections (82 per cent) were less than 15 per cent. All 11 corrections, along with their depth, length and date of market trough are detailed in the chart below. Also included is the latest correction. All up, this analysis suggests that if we are truly in only a market correction, then it's likely we’ve almost reached bottom. That said, it could take a few more weeks, even months, before the actual bottom is in place. To gain an insight into long-run trends over time, the chart below details the peak-to-trough declines in closing daily prices of the US S&P 500 Index over this period. Just eyeballing the chart, it’s evident that overall market volatility does not appear to have appreciably lessened. If anything, since the early 1990s there have been two relatively extended periods of low volatility but also two relatively deep and more extended bear market periods. This is consistent with the “Great Moderation” in macro-economic volatility in recent decades, but also the potentially greater threat now posed by financial market imbalances in creating bear markets. Indeed, the two greatest bear markets since the Great Depression also happen to be the two most recent – the early 2000s dotcom crash and the 2007-09 financial crisis. What’s the implication of all this? To the extent the recent extended period of low volatility does manage to reassert itself for a time, history suggests this may build up pressure such that the next inevitable bear market could also prove relatively deep and protracted. David Bassanese is chief economist at BetaShares.